Fire Up : The only CD available for instant motivation! The CD contains 20 slideshows with upbeat music, stunning visuals and clear messages that will take your meeting, huddle or training to the next level. Ensure your audience is engaged with a completely new tool! Buy Fire Up CD today! The slideshows in the CD can be easily incorporated as part of any message you want to convey. Use the CD in your presentations to add a new dimension to your presentations! View pain as progress etc. Fire Up CD is the easy way to generate enthusiasm among your team after a logic and numbers filled session. Sales Managers in various industries are using this CD to Fire Up their team for more sales by playing the CD in daily meetings. Add the power of this CD to your meetings right away by visiting our web store. Add a new tool to your training kit! 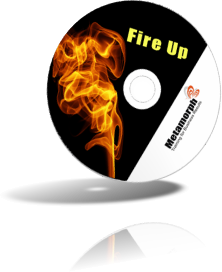 Fire Up CD is a fantastic way to energize your audience during any training program. If you are looking for a way to stress your motivational messages, this CD is just perfect for you. Add this CD to your training kit just like hundreds of trainers in India! Visit the Web Store today!